When we got chickens it was for the eggs. Our initial set of pullets were born sometime in early April. That means our pullets wouldn't be ready to lay until at least September. Mr. Native Farmer isn't a patient person and he gets a bit of look-over-the-fence-itis. We have 17 chickens, 14 hens and 3 roosters (that many roosters isn't as bad as it seems). Now technically we should be getting 10ish eggs a day by now. 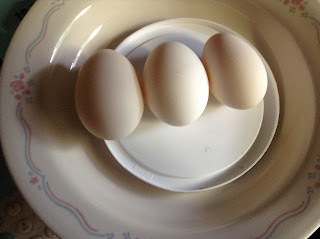 My lovely husband is getting restless, he sees the eggs our cousins are getting or a neighbor are getting and he complains a bit about out 3-a-day average (our biggest amount was yesterday at 6 and today was 2 eggs). Let's note both the neighbors and our cousins' chickens were born in February and purchased in March. One set are Rhode Island Reds which lay 2 eggs a day, and the other set are a mixture of chickens who also tend to lay 6 times a week. Our chickens on the other hand are 2 months younger and the breeds range from 3-6 times a week. I do have to say the ones that are only suppose to lay 3 times a week definitely exceed that at the current moment, they lay more like 5 times a week. 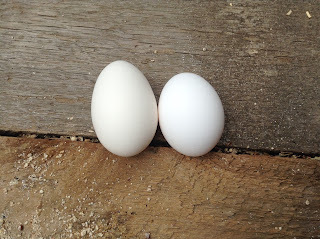 In the last two weeks we have been getting more and more "first eggs" here on the farm. One day we had 2 first eggs. 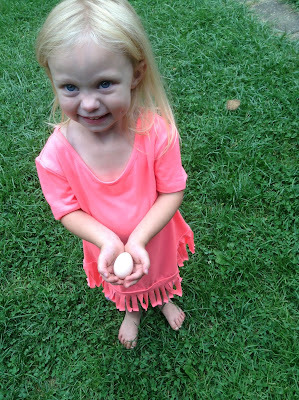 Now for those of you who haven't had chickens before (raises hand), first eggs are a bit of a shocker. Most blogs will tell you about the hilariously small eggs from new layers but they forget one fact. First eggs come out a bit bloodied. We have had from a small spot on the shell to down right covered. Yup it isn't pretty, which is probably why no-one mentions it or photographs it. Don't worry no photos of bloody eggs here either but I thought you should know if you are waiting for your first eggs. As for size... I finally got a hilariously small egg AFTER getting 5 new layers first. Yeah, my hens laid pretty decent sized first eggs. Actually, I even thought maybe a bird from outside had gotten in and laid an egg it was so tiny compared to the other first eggs. My hens are also laying in the pine shavings and not in the nesting boxes (sigh) so finding that tiny one was quite a trip. 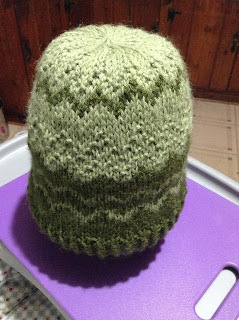 I believe it was from a silkie based on the size of egg it will eventually become. My other first eggs have been on the border of pewee and small in weight so not so bad, but the smallest was only 19g instead of the 35-40g of the others. Today I had a first egg weigh 37g and a sebright egg (one of my few white egg layers) weigh 35g so it was bigger then my normal eggs! 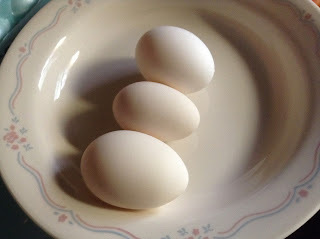 Brown leghorn (bottom and left), First egg -- cleaned (middle), and Sebright -- it looks cream but it was white (top and right). We have about 8 new layers, 4 old layers and 2 undecided. One of our Brown leghorns decided to go broody so no eggs from her for a while, it took my sebrights about 2 weeks to recover from when they went broody on me in the summer. Now, experience chicken owners may know, leghorns aren't typically good brooders, and they lay white eggs (they are what most of the eggs are in the supermarket). This leghorn went broody and its the one that lays cream eggs so go figure. The two chickens not laying are the little bannie, she is only 5 months old and I believe one of my australorps that may be a rooster... but she just looks like a rooster, she doesn't act like one.